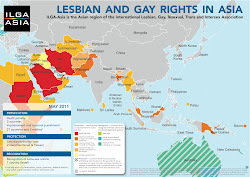 This ILGA-Asia, with its complexity and full diversity, offers LGBTI activists the opportunity to strengthen their work and to build on new networks and friendships by sharing their experiences and successful strategies. Having here together more than 200 participants from 30 countries will for sure enrich our work perspectives for all and contribute to the empowerment of each. I am very happy to come back to Asia, now in Thailand, but specifically to be part of this conference.